"The Immigrant" at George Street Playhouse with Benjamin Pelteson, Gretchen Hall and R. Ward Duffy. Photo by T. Charles Erickson. Playwrights Mark Harelik and Randal Myler honor Harelik’s grandparents, refugees from Russian pogroms who settled in Texas in the early 1900’s, in the bittersweet memory play The Immigrant now playing at the George Street Playhouse in New Brunswick. It is a gentle, loving look at the courage required to come to a strange land, penniless and alone. A play of growth and understanding, it is an antidote to modern-day fears of the “other.” It serves as a reminder that America’s strength, America’s growth, comes in large part from the waves of immigrants that seek a better life here. 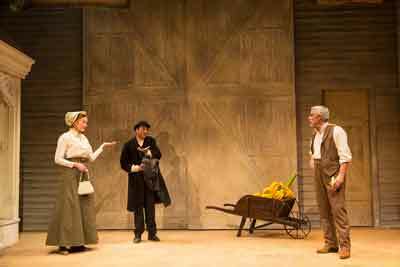 “The Immigrant” by Mark Harelik is at the George Street Playhouse. Photo by T. Charles Erickson. In the early 1900’s, Chaskel Garelik (Benjamin Pelteson) arrives in Hamilton, Texas from Czarist Russia via the port city of Galveston. Peddling bananas from a laden wheelbarrow, he stops to rest outside the home of local banker Milton Perry (R. Ward Duffy) and his wife Ima (Gretchen Hall). Chaskel, playing on Ima’s sympathies, talks them into renting him a room. “The Immigrant” at George Street Playhouse with Gretchen Hall, Benjamin Pelteson and R. Ward Duffy. Photo by T. Charles Erickson. He teaches himself English at night, saving his money to bring his wife Leah (Lauriel Friedman) to America. Helped by loans from Milton’s bank, Chaskel — now called Haskell Harelik — progresses from the wheelbarrow to a horse and wagon to his own store. As the years pass, the Harelik family grows and prospers, forming closer ties with the Perrys. However, simmering frictions between Haskell’s and Milton’s points of view result in an argument during the Perrys’ first Shabbos dinner at the Hareliks’ home. Harelik and Myler’s play finds moving interpretation from the cast, sensitively directed by Jim Jack. Benjamin Pelteson and Lauriel Friedman capture the fears and exhilarations of the many who, with unshakeable determination, make a life for themselves that they could never have had in their birth lands. R. Ward Duffy and Gretchen Hall embody those who, slowly and at times reluctantly, see past the otherness of strangers to the shared humanity within. The journeys of their characters is handled with sensitivity and simple honesty nearly every step of the way. “The Immigrant” at George Street Playhouse with Gretchen Hall and Lauriel Friedman. Photo by T. Charles Erickson. George Street’s production team has made good use of the stage space, depicting the exteriors of both couples’ homes and using the center stage space for other locations both external and internal. Credit goes to scenic designer Jason Simms, lighting designer Christopher J. Bailey, sound designers Scott Killian and Christopher Peifer, and projection designer Caite Hevner. Asta Bennie Hostetter’s costumes gracefully depict not only the passing decades but also the rising fortunes of the Hareliks. The Immigrant is a truly American tale in every sense of the word. Common conceptions about the immigrant experience are refreshed by being set in a locale not usually connected with the European migration of the early 20th century. 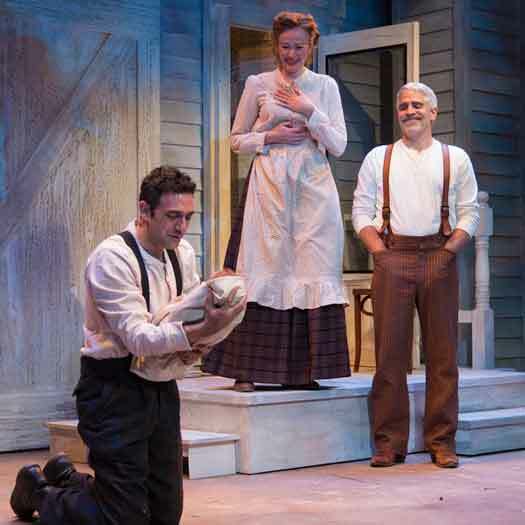 To get a taste of the America described as a “nation of immigrants” and a “melting pot”, I recommend you see George Street Playhouse’s moving presentation of The Immigrant. 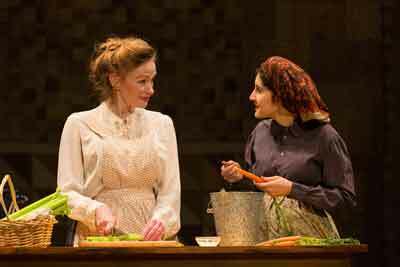 The Immigrant is presented by the George Street Playhouse on the Cook College campus of Rutgers University in New Brunswick through April 7, 2019. For tickets and information, visit GeorgeStreetPlayhouse.org.